I have often joked that using black walnut hulls on white wool is perhaps not the best use of my time. Black walnut hulls make various lovely shades of brown, but there are plenty of brown sheep. Dyeing cotton brown, on the other hand, makes sense. There are naturally brown cottons, but they are not commonplace. Sally Fox has spent many years breeding naturally colored cottons in a range of beautiful colors, which you can see for sale here. However, most of the cotton that’s available at the moment is white. 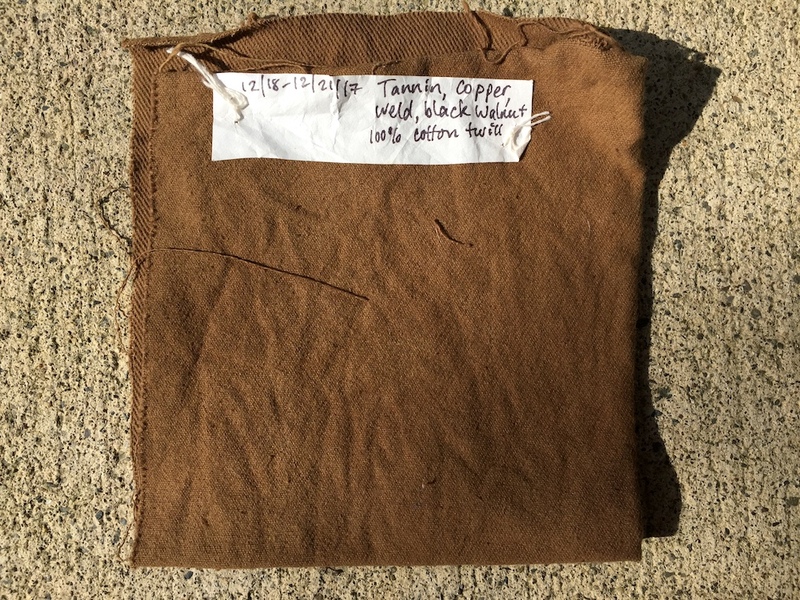 Using the same heavy cotton twill samples that I used for the tannin-iron-madder and tannin-copper-weld experiment, I ran some samples with black walnut hulls. I should note that black walnut itself is a source of tannin, so the tannin step at the beginning was probably redundant. 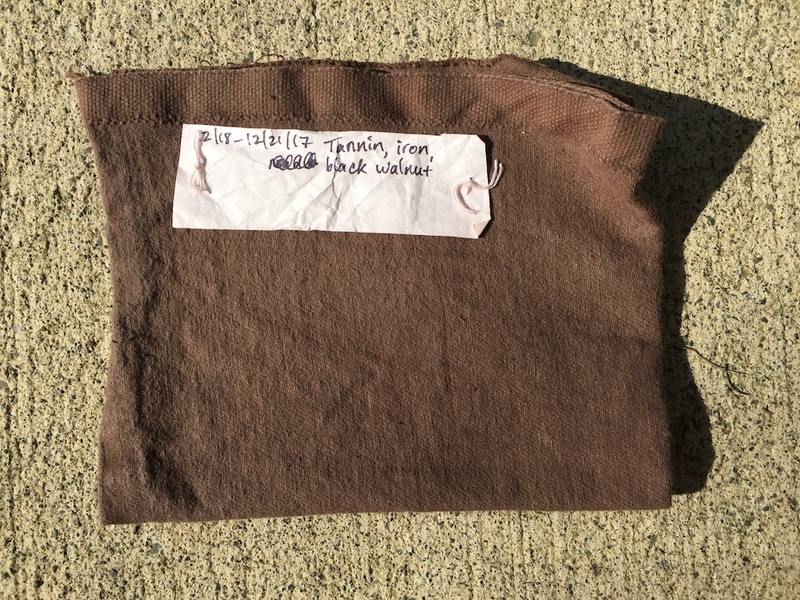 However, for this series of experiments, I treated the whole piece of cloth with tannin originally before I cut it up for samples. I usually use walnut hulls when they are fresh in the fall. But since it was winter, I used dried hulls. I made the dyebath with 1.5 oz. dried hulls, which I extracted three times over three days and then combined the dyebaths. I am a fan of really giving the plant material time to soak to get the most out of it. This is especially true when the material is dried and woody. As you can probably read on the label, the sample above was made with the sequence tannin, copper, weld, black walnut. You can read all the steps in the tannin-copper-weld process in my last post. I cut that piece of cloth in half and then in half again for these walnut experiments. 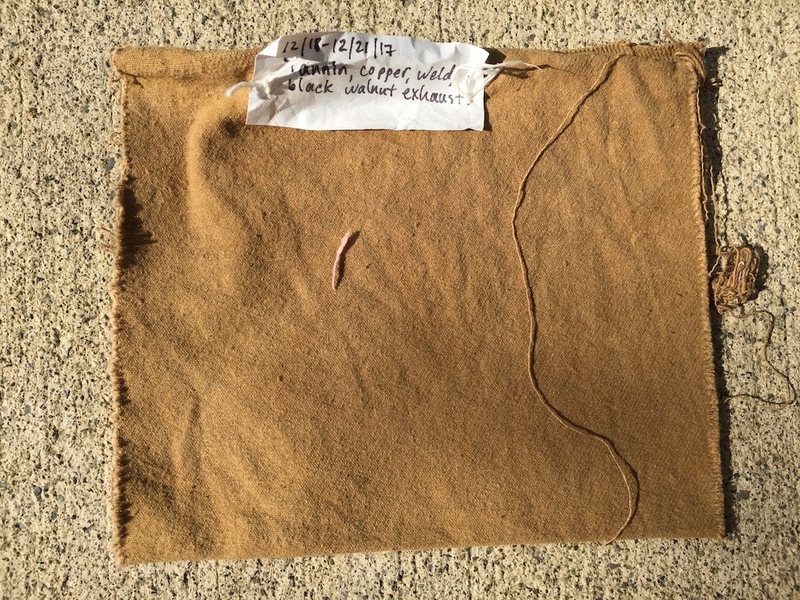 This one was dyed in the original full-strength walnut dyebath, along with the sample below. With all of these walnut samples, I brought the bath up to 180 degrees, kept it there for an hour, and cooled the fiber in the bath overnight. Above you see tannin, iron, black walnut. It was dyed in the same full-strength bath as the sample above it. For the iron process, see my earlier post about “Amish Purple”. I really like this warm chocolate brown. I was expecting a darker gray-brown because of the tannin-iron combination, but I think that would require a more concentrated black walnut bath. The sample above was tannin, copper, weld, black walnut exhaust. “Exhausting” means using the same dyebath again to get a lighter color. After I pulled the first two pieces out, I put in this sample and the one described below. The stray pink thread is from the madder exhaust (which I will write about later). The sample above is tannin, alum acetate, black walnut exhaust. 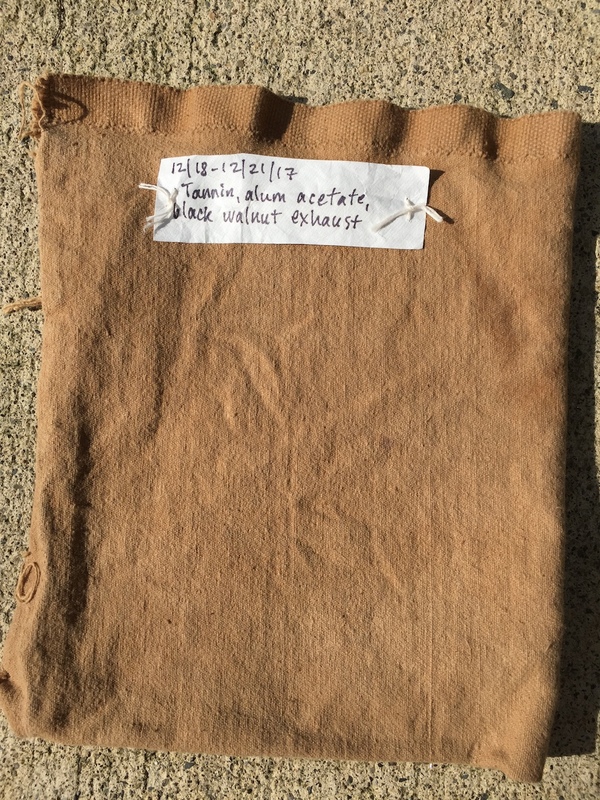 Alum acetate is the mordant that I usually use with cellulose fibers. Many dyers recommend it for cellulose, rather than aluminum sulfate (which is what I use on wool). After the tannin treatment, I mordanted some of the cloth with alum acetate at a rate of 5% of the weight of the fiber. Use caution with alum acetate, as the powder is very fine and light, and goes airborne easily! Once it was dissolved in the dyepot, I added the fiber and maintained the temperature at 100 degrees. That’s basically the temperature that hot water comes out of my tap, so it doesn’t really need to be heated at all. Maintain that temperature for an hour, stirring regularly. As with other dyeing steps, I usually let things cool overnight. 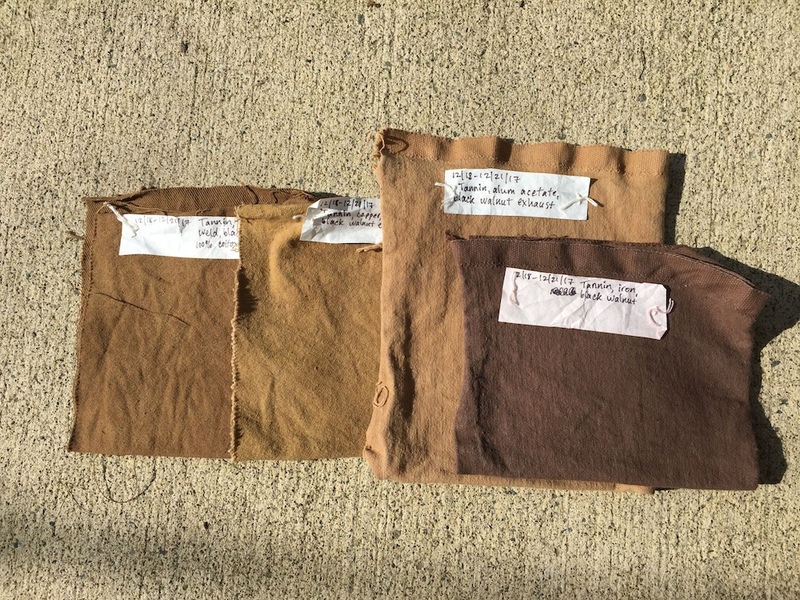 From left to right, they are: tannin-copper-weld-black walnut; tannin-copper-weld-black walnut exhaust; tannin-alum acetate-black walnut exhaust; and tannin-iron, black walnut. A nice range of browns!